“Remember that you are dust, and unto dust you shall return” are the words one hears when ashes are formed in the sign of the cross and imposed on the forehead on Ash Wednesday. The ashes come from the blessed Palm Sunday celebration of the previous year and the moment serves as a launching point for one’s Lenten Journey of praying, of fasting, of almsgiving – sacrifice. 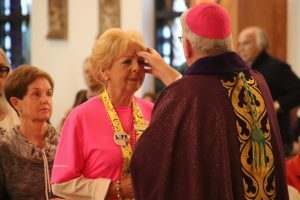 Bishop Frank J. Dewane stressed during a Mass at St. William Parish in Naples, that on this journey of salvation, as one moves forward, one is called to discipline oneself to be the ever more for the Lord. A key component of this is to renew one’s heart, the Bishop added. While attending Mass on Ash Wednesday is a good start, Bishop Dewane said that it is very easy to get too busy with the motions of the Lenten Season and miss the motivation. “Why is it we are here? What is it we do? Why do we do it?” the Bishop asked. “It is in our heart, as human beings, where that love and motivation can most profoundly occur. Go forward – as you are starting out well – but look at the motivation. If one needs to make more connections with the Lord, do so. Be very mindful in expressing to the Lord, clearly in one’s prayer, what it is that motivates you and also seek the help one needs from the Lord. The ashes were used as a sign of repentance in the Old Testament, and to serve as a public sign of our intent to die to our worldly desires and live in Christ. Ashes also symbolize grief, in this case, grief for our sins. Pope Francis said on Ash Wednesday that fasting from food or other things during Lent is a chance for Catholics to reorient their material attachments, and the Holy Father urged people to slow down and turn to Christ during the penitential season.